As intelligent fantasy owners most of us were aware that Chase Headley was a talented player working in a ballpark that was not an ideal hitting environment. His 2012 season totals were a little shocking. I have heard many reasons for his new found power, some more reasonable than others. The natural development of a talented player with an improved approach. The perfect storm of atmospheric conditions that resulted in the wind blowing out of Petco Park the last two months of the season. Luck, just a hot streak with amazing results. I have listed the above theories in order of my willingness to believe them. His homeruns were headed towards a career high even before the big boost. He had 12 homers at the end of July which was just one short of his former career high. But nothing appeared to be drastically different until August when he hit ten homers and he followed that with nine more in September/October. Before August his high month of the season was just four homeruns. For the season Headley hit more groundballs than in seasons past and fewer flyballs. But in July, August and September/October his flyball rate saw a significant jump from the high 20s to the low to mid-30s. Could he have changed his swing? Did he make an adjustment that did not start to click until the second part of the season? It would explain his rather poor start to the season (in all but homeruns). Well according to an article in Sports Illustrated that is exactly what happened. That plan to inflict damage on a baseball and an opponent drove Headley's approach last year, aided by a refinement to his switch-hitting swing paths to produce more backspin on the ball. Headley has always been a patient hitter, who in the previous year concentrated too much on swatting pitches to the opposite field. In learning to be more aggressive early in the count and adjusting the mechanics of his swing, he saw a power explosion from four home runs in 2011 to 31 in 2012, the most by any National League third baseman. "My job is to drive in runs and to do damage, not to see pitches," Headley said in camp last week. "The year before I worked so hard on hitting the ball the other way that I was pretty good at that, but then I'd get a pitch that I could handle and I couldn't take the right swing to it. I was getting a pitch that I could drive, and I'd topspin it because I was pulling off the ball a little bit on the pitch in. "I had four home runs the year before and had three opposite-field home runs. I just couldn't pull the ball in the air. It was about getting back to a swing that would allow me to put the ball in the air to the pull side." What can we expect from Headley in 2013? It is important to note that the Padres have decided to move in their outfield fences in hopes of becoming a less extreme pitchers park. We can probably expect something less than 31 homers from Chase as the August through October numbers still seem a bit crazy. I think a projection along the lines of .285/.375/.480 with around 25 homers and 15 stolen bases is fair. That makes him an excellent selection at third base in mixed leagues and arguably the best choice for NL-only leagues. Adrian Beltre, Texas Rangers - Beltre is the best he has ever been. A true professional hitter with serious power playing a major role in a great lineup in a favorable hitting environment. The distance in skill between he and Cabrera is probably not as much as you think. Evan Longoria, Tampa Bay Rays - Longoria has it in him to be at the top of this list. The primary obstacle between Longoria and a tier one ranking is durability. The rate of production is top notch he just needs to have better luck with injuries. 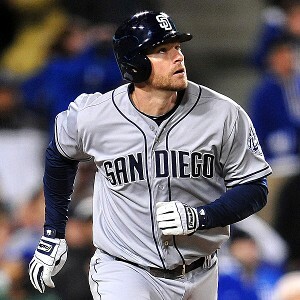 Chase Headley, San Diego Padres - A player in the prime of his career playing in a park that has stolen some of his glory. But his improved swing mechanics and the changes to Petco promise a run of nice power numbers. Ryan Zimmerman, Washington Nationals - Zimmerman is solid in every aspect of the game and he is presently hitting in the middle of one of the better lineups in the game behind a player being compared to Mickey freakin' Mantle. Expect those RBI totals to take a big jump up. Aramis Ramirez, Milwaukee Brewers - At his age the risk of decline is rather high. He looks like a second half player these days - if you believe in that sorta thing. The production has been very good overall. David Wright, New York Mets - The ballpark and his approach to it has stolen some of the homeruns from his game. But he is a great hitter who could win a batting title in any given season. He has solid power and steals more bases than most at the position. David Freese, St. Louis Cardinals - Freese hits for average (a disappearing skill) and has 20-plus homerun power in the middle of a great lineup. His problem in the past has been with injuries but his 567 plate appearances in 2012 is a positive sign. Pablo Sandoval, San Francisco Giants - His production has been as inconsistent as his commitment to conditioning. He can hit and he has nice power but until he learns to own a consistent focus on improving his game he won't be the player he could be. Brett Lawrie, Toronto Blue Jays - Some were disappointed with his full season debut but those folks were expecting too much. He proved to be the type willing to run through walls and his manager and fantasy owners wish he would stop. A season with 20 homeruns / 20 stolen bases with a decent batting average could be in his near future. Mike Moustakas, Kansas City Royals - Injuries slowed him a bit but he flashed that big time power potential. The hopes of the Kansas City fan base have created high expectations for Moustakas and the other young Royals. This could be their year. Kyle Seager, Seattle Mariners - His 20 homeruns and 13 stolen bases surprised a lot of people. The walls are coming in Seattle so there is hope that Seager has even more to offer in a more neutral hitting environment. Todd Frazier, Cincinnati Reds - He showed nice power hitting 19 homeruns in just 465 at-bats. He should start from wire to wire this season in a great lineup. He still has some power upside. Pedro Alvarez, Pittsburgh Pirates - By becoming more aggressive at the plate Alvarez put his power on display. His HR/FB may come down a bit but the power is real. Even with high BABIPs you should not expect to see much of a batting average. Will Middlebrooks, Boston Red Sox - This ranking probably gives him a little too much credit for a solid half season of production. He swings at too many outside pitches. His k-rate has always been high and I'm actually a little surprised it was not higher in 2012. His 2012 HR/FB of 21.4 percent seems kind of high but he doesn't have much track record to go by either way. Bid cautiously as you could own him during an adjustment period this season. Manny Machado, Baltimore Orioles - Every baseball fan who knows who Machado is also knows that he was rushed to the majors last season. He did well under difficult circumstances and his ceiling is very high, especially if he finds his way back to shortstop. Expect some some struggles as he adjusts to the Major Leagues. Trevor Plouff, Minnesota Twins - All the flyballs drive his average down but there is some potential for a decent batting average. The power was nice but could have been a bit over his head. He seems destined for full-time at-bats this season as the regular third baseman so the playing time could help him repeat or even slightly better the power numbers. Alex Rodriguez, New York Yankees - I have seen A-Rod go for single digits in AL-only auctions this season. It could be that owners in general are afraid that Rodriguez will not return this season. He has several years left on his contract and is still productive when healthy (I know that is becoming rarer) so keeper league owners should scoop him up at single digit prices and find a replacement in the deep third base pool. Kevin Youkilis, New York Yankees - When a player has a poor season blaming it on the manager is pretty stupid. When every key player on the team has an off season blaming it on the manager becomes something closer to understandable. Youkilis still has the great patience, plate discipline, strong contact rate (even with the slowly rising K-rate) and solid power. A bounce back to 2011 levels is a reasonable expectation with some upside if he can stay healthy. Michael Young, Philadelphia Phillies - In 2011 Young had one of his better seasons with a line of .338/.380/.474 and by far his worst in 2012 by batting just .277/.312/.370 with just 8 homeruns. If you read a lot of advanced statistical articles on sites like fangraphs.com you are probably very well scared off of Young forever. But for fantasy purposes Young's 2012 line was just disappointing. We don't much care that his lousy defense resulted in a negative WAR. He had lousy BABIP luck relative to his career levels (.334) and his O-swing was the worst of his career. He is aging and slowing but I expect his bat to come back. If it helps, Young says he identified a flaw in his swing over the offseason. Lonnie Chisenhall, Cleveland Indians - This former top prospect did not post any mind blowing numbers in the minors but proved to be patient at the plate with strong contact skills and some nice power potential. Some fantasy analysts think they have him pegged based on his less than a half season combined in the Majors but I doubt they do. Expect a solid batting average (.270-plus) with 15-20 homeruns (maybe even more) if he gets to play the full season at third base. Chris Johnson, Atlanta Braves - We have not seen Chris Johnson produce for a full season but we have seen some impressive streaks of production. He does not walk enough, strikes out a little too much - mostly the result at swinging at tons of pitches out of the zone. He does have good power but his poor approach limits the results. The Braves have been good at fixing swing flaws in the past, maybe they can do something for Johnson. Matt Dominguez, Houston Astros - Dominguez has made quite a few improvements with his swing over the last year. He has eliminated a lot of movement and changed the position of his hands to create a shorter swing path. Of the players in this tier he is my favorite for a big move upward. Josh Donaldson, Oakland Athletics - He finished the 2012 season well and his minor league statistics suggest it was not a fluke. He has had some BABIP issues that made him look worse than he really is. The potential is there for a strong season. A solid batting average with 15 or so homers and 5-10 stolen bases is not out of the question. Placido Polanco, Miami Marlins - He is becoming old and brittle and signed with the lowly Miami Marlins hoping to rejuvenate his career. At his best he hits for average but without the power of even the average third baseman. Wilson Betemit, Baltimore Orioles - If we knew he would play every day Betemit might qualify as a sleeper of sorts. But he has a ton of competition for at-bats as the designated hitter and he has very little chance of taking over at first or third where Chris Davis and Manny Machado are quite secure. Alberto Callaspo, Los Angeles Angels - Frankly, I am a little shocked that he somehow still the Angels third baseman. He only ranks this high because he a starter in a loaded lineup and should get runs and RBI even with his poor production. Macier Izturis, Toronto Blue Jays - Izturis is batting for the starting job at second and I hope he doesn't get it. He is not much better than Callaspo as a fantasy option and he would be putting better players on Toronto's bench. Jerry Hairston, Los Angeles Dodgers - He never has a starting job these days but he seems to find at-bats anyway. The Dodgers have what appear to be holes at second and third base. Mark Ellis is in there for defense and Luis Cruz is living off a strong finish to the 2012 season. Hairston should find at-bats again, he's an excellent guy for your bench. Eric Chavez, Arizona Diamondbacks - Eric Chavez produced like his old self for the Yankees last season. Why the Yankees chose not to re-sign him will remain a mystery that only Brian Cashman can solve. The Diamondbacks were smart enough to sign him but then blocked him with the Martin Prado acquisition (some call it the Upton Trade but I prefer the Prado Acquisition). Luis Valbuena, Chicago Cubs - Frankly, Valbuena is probably a better hitter than Stewart at this point but the power pedigree dies really hard and the solid all around skills guy is quickly forgotten. Ian Stewart, Chicago Cubs - I think it is safe to call Stewart a bust. He still has great power but could not hit his way out of a wet paper bag. Brent Morel, Chicago White Sox - He seems to be the forgotten man on the South Side. He is young enough that it is worth keeping him in the back of your mind. This is especially true if you do something like draft Jeff Keppinger as your starting third baseman. Chone Figgins, FA - He went from a fantasy favorite to irrelevant with the lightning speed he used to show on the bases. Still, I bet someone picks him up. Kevin Kouzmanoff, Miami Marlins- I finally learned to spell his name and he became irrelevant. Ryan Roberts, Tampa Bay Rays - I will be shocked if the Rays give him any significant at-bats. Juan Uribe, Los Angeles Dodgers - He lost something when he came to Los Angeles. Is it mean to suggest it was a PED connect? Sorry, he got deleted by accident, I thought I'd fixed my blunder but apparently not. He'll be back in a minute or two. Thanks. Freese is fixed, hopefully no one else is missing. I accidentally deleted part of the 2nd and third tiers and thought I had fixed it.